While it wasn't his first venture onto the field for the Miami Dolphins, October 9th, 1983 would be the first time that a rookie quarterback from Pittsburgh named Dan Marino would start for the Dolphins. Marino had played admirably in relief against both the Los Angeles Raiders and New Orleans Saints, but head coach Don Shula had decided that it was time to make Marino a permanent fixture at the quarterback position. The Dolphins were coming off of a 17-7 loss to the Saints and quarterback David Woodley's performance was once again shaky. Along with teammate Don Strock, Woodley had helped Miami reach Super Bowl XVII the previous season which may have been the biggest reason as to why Shula was slow to go to Marino. But after a 3-2 start to the season, a change seemed necessary. 30 years ago today, Marino made his first start. At home in the Orange Bowl against a Buffalo Bills team that entered the contest also at 3-2, it was Marino who would take the first snaps under center for the Dolphins. Miami would not win that day, but the performance by the rifle-armed rookie proved to most that Dan Marino was there to stay for the Dolphins. Miami trailed 14-0 early, but touchdown passes of 63 and 48 yards to Mark Duper, one from Marino and one from wide receiver Mark Clayton on a trick play, had the Dolphins even with the Bills, 21-21, at the end of three quarters. After Joe Ferguson's fourth touchdown pass of the day gave the lead back to Buffalo, Marino led the Dolphins on a game-tying march throwing a short touchdown pass to Nat Moore. 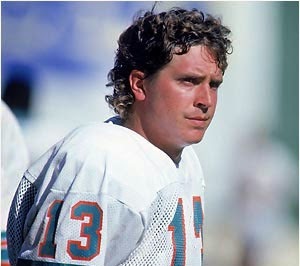 Later in the fourth quarter, Marino gave the Dolphins their first lead of the game hitting Clayton for a 14-yard score. Buffalo tied the game at 35 on the fifth touchdown pass of the day from Ferguson and ended up winning 38-35 in overtime on a 36-yard field goal by Joe Danelo. While Ferguson stole the show that day throwing for 419 yards and five scores, it was apparent to Miami fans that a new era of Dolphin football had arrived. Marino finished the day 19-for-29 passing for 322 yards, three touchdowns and two interceptions. Miami fell to 3-3 that day, but would win nine of their final 10 games to run away with the AFC East crown. The starting quarterback position was now Marino's and it would be one that he would hold on to for the remainder of the season and the next 16 to follow. Although the contest ended in a loss that day, Marino was building a rapport with his wide receivers. Duper finished the afternoon with 207 yards receiving while Clayton added 53 yards and a score. Duper and Marino would hook up for more than 8,000 yards and 58 touchdowns while he and Clayton connected for 8,468 yards and 79 touchdowns throughout the courses of their careers. Marino would go on to start 240 games for the Miami Dolphins winning 147 of them. At the time of his retirement following the 1999 season, Marino held virtually every major passing record. Over Marino's 17 seasons, the Dolphins finished with a losing record just once. With Marino now in the Hall of Fame, his jersey retired and a statue of him now sitting outside of Sun Life Stadium on Dan Marino Boulevard, it was 30 years ago today that number 13 made his first NFL start for the Miami Dolphins.